Judith has many great memories of trips with family and friends to Sylvan Heights Bird Park in Scotland Neck, North Carolina. She is currently working on a series of paintings about the birds she’s photographed while there. Her next painting in this series will be about flamingos during nesting season. 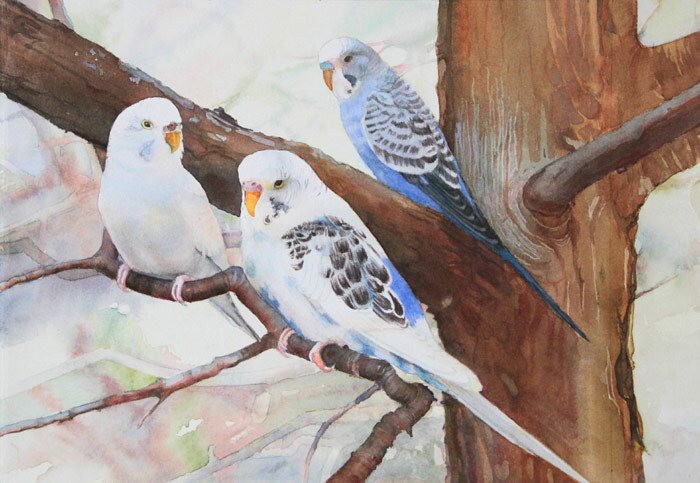 This painting of budgies is done in the traditional way, using only transparent watercolor. 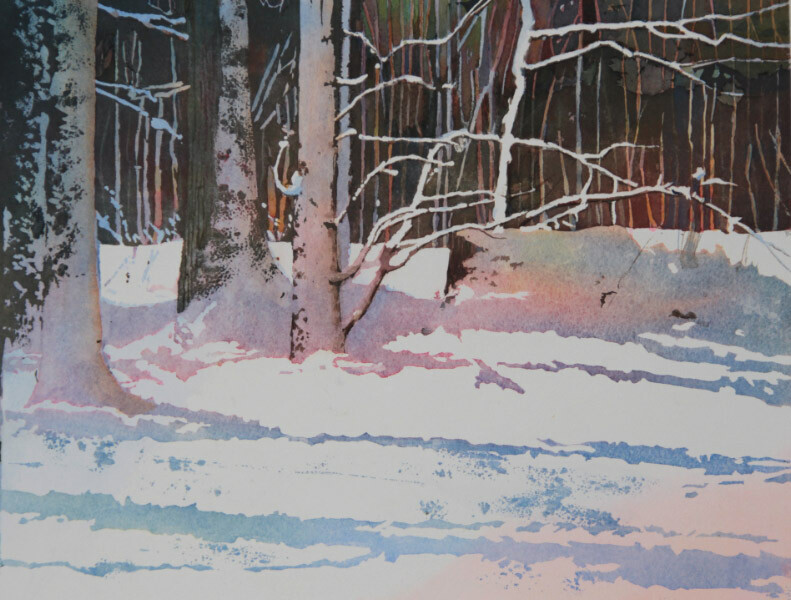 Some parts of the painting, like the tree, are done in multiple layers of color, while the light colors of the background are mostly done with one layer, but it is all paint applied with a brush. This is a painting of her neighbors’ backyard in the snow. 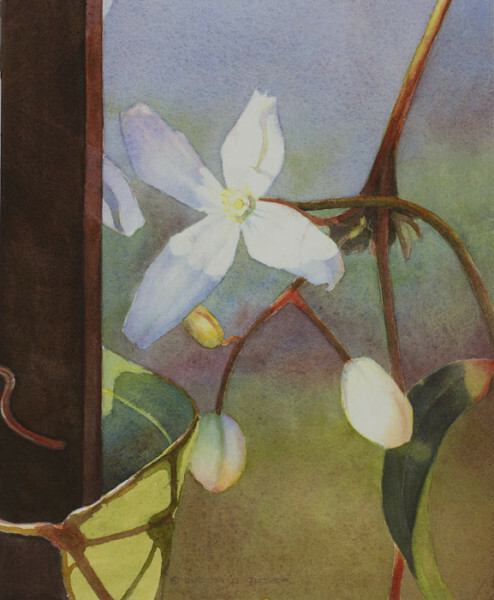 The painting was done by applying masking agent to the parts of the painting the artist didn’t want to change when she added more watercolor. 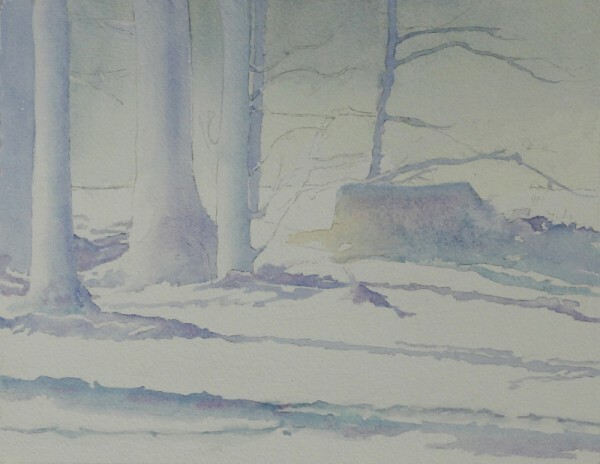 In this painting all the whites of the snow were blocked out before any paint touched the paper. 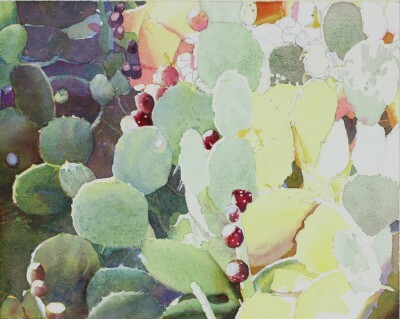 Once the desired areas were covered with masking fluid she poured a single paint color over the whole painting. After this layer of paint dried, the next layer was more masking fluid added in new places where Judith didn’t want more paint. These two steps were repeated until the painting was almost completely covered with masking fluid. Each layer of paint changed the unmasked areas just a little and left the masked areas as they were. Near the end of this process the painting was really ugly, because the masking fluid covering it was opaque and gray. Then Judith used a rubber cement remover to lift all the masking fluid, and the surprise was what you see here. These are the first few layers of a snow scene from my neighbor’s yard. It looks so pleasantly mystical that I’m delaying further progress, but there are many dark colors going in here as soon as I apply some masking fluid to save the snow on the tree trunks and branches. 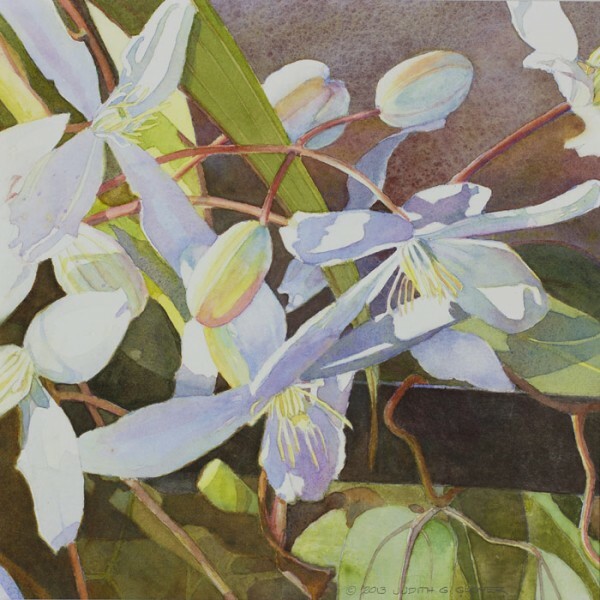 Evergreen Clematis I is one of three paintings I have for sale in the Art Bazaar at the historic Blount-Bridgers House, 130 Bridgers Street, Tarboro, NC. 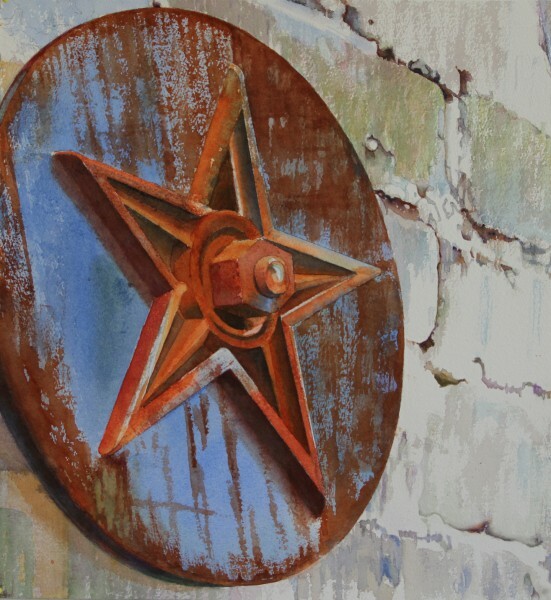 The Art Bazaar is sponsored by Edgecombe Arts and is open to the public through Saturday, December 13. 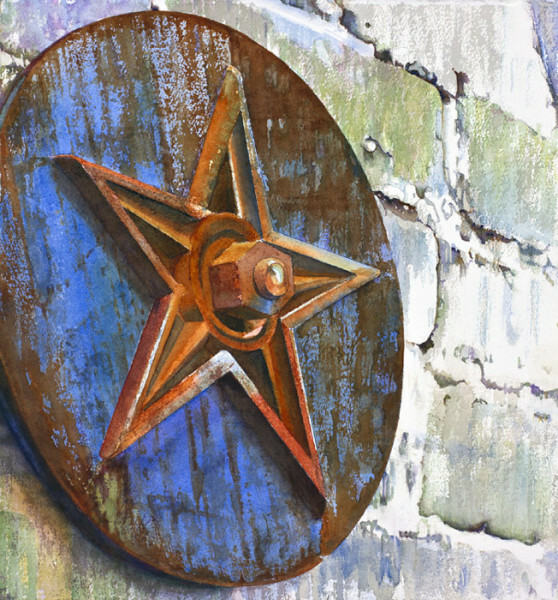 This exhibition is a great place to shop for unique Christmas gifts, and while you are there you can explore historic downtown Tarboro. The first in a series of paintings based on the vine that grows on a trellis in our backyard. 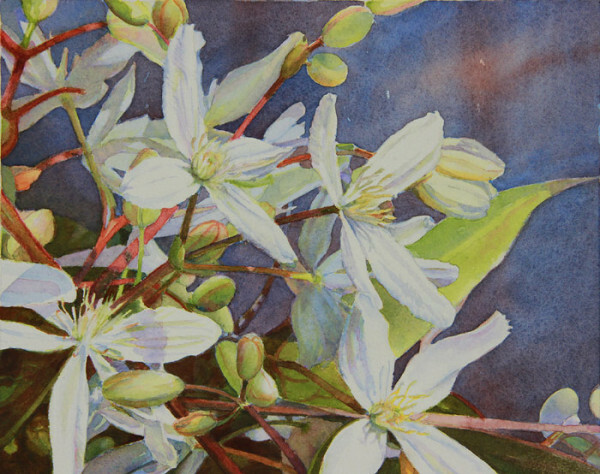 Part of a series of paintings of an evergreen clematis in bloom in early spring. and used with her written permission. A painting of a cactus found growing along the beach at Sandbridge, VA. I first saw earthquake bolts in Charleston, SC. They were used to reinforce or rebuild homes that were damaged or destroyed in the earthquake of 1886. The earthquake bolt you see in this watercolor painting was first spotted by my grandson, John Tyler Brumfield, while we were on a family vacation. It’s on a building in the historic area of Staunton, VA. I am guessing this earthquake bolt is used to keep the building from falling into Lewis Creek that runs underground in parts of Staunton. I have been told there are other earthquake bolts on other buildings in Staunton, but I am fairly sure there has never been a significant earthquake there. Back home in Rocky Mount, NC, I discovered earthquake bolts on one of the buildings at Rocky Mount Mills on the Tar River. Here the bolts are used to keep the second floor of the main building from collapsing onto the first floor if there is fire. Since the cotton mill burned several times in the nineteenth century, fire was a real concern when the mills were in operation. Here is a brief history of the 1886 earthquake in Charleston, a description of the iron plates, nuts, and rods that make up the earthquake bolts in Charleston, and pictures of earthquake bolts on Charleston’s buildings. Tell me what you know about other earthquake bolts on buildings. Come be my guest in the new studio where I have been working since the first of November. I’d love to see you there. This beautiful invitation was designed by Melinda Schmitz whose husband, Ray Schmitz, is one of the artists at the Bel Air Artisans Center. 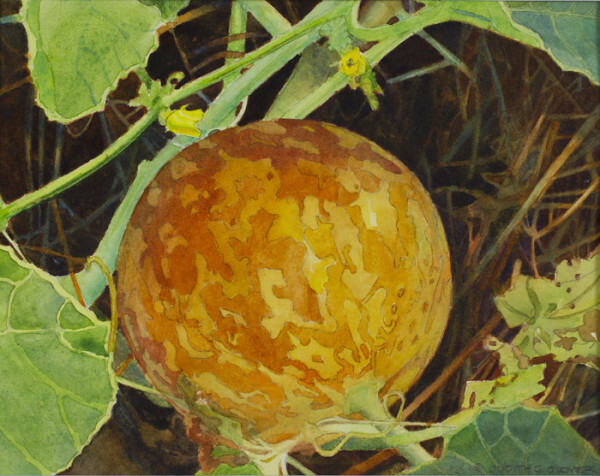 The Watercolor Society of North Carolina and Barton College are hosting a reception on Saturday night, November 9, 2013, from 5:00 to 7:00 PM, in the Case Art Building on the Barton College campus. 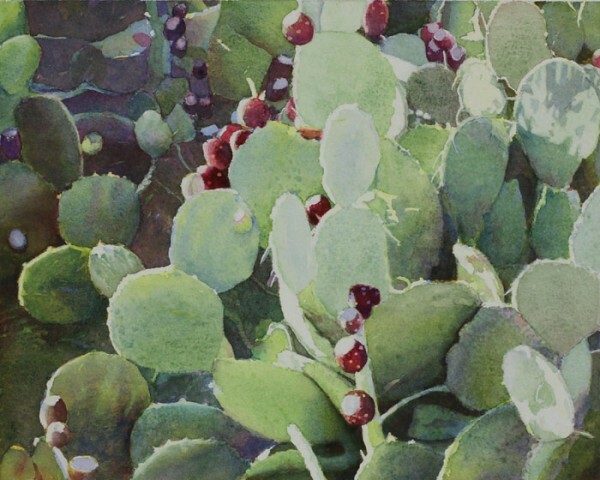 Forty works by forty different artists will be on display, and Prickly Pear Cactus is my piece in this exhibition. You are invited to the reception and I look forward to seeing you there. If you are already busy Saturday night and the reception is not an option, then the exhibition is up through December 16. The Case Art Building is open to the public from 10:00 AM to 3:00 PM Monday through Friday. Parking is available on Whitehead Street. Here’s the progress I made last week on this small watercolor painting. I’ve added more dark areas and more of the light green layer. I’ve also added masking liquid to save the light areas in the red part of the cactus. Here is my finished watercolor painting, Prickly Pear Cactus. It is part of a series of small paintings, 8″ X 10″. It is the first painting I have done on cold press (the traditional surface for watercolor) paper in a long while. I usually use hot press with a smooth surface. Watercolor painters, what kind of paper do you use? Where there is only one layer over white or yellow, I have used a pigment called Oxide of Chromium. Tell me if you also paint in layers of if you prefer to do all your mixing with a brush or a palette knife. PAQA-S has been more important to my artistic development than any other professional organization I’ve belonged to in the last seven years. Now, in 2013, the events on January 25 and 26 are open to artists working in any medium and I want to share the possibilities of this experience with as many friends as possible. I would love to see you in Cary, NC! January 10, 2013 is the postmark deadline for registering for the 2013 Conference and Annual Meeting. The workshops are not art quilt specific and are open to the public. Please share this information with anyone you think may be interested. The 2013 Conference and Annual Meeting will be held at Page-Walker Arts and History Center in Cary, NC on January 25 & 26, 2013. The conference will coincide with the artist receptions for our latest exhibits ARTQUILTSwater and ARTQUILTSrivers and will feature two workshops and an art quilt photographer. Here’s a quick review of what’s happening with a link to more detailed information and registration form. We hope you will be able to join us in January. The artist of the parody below is unknown. Stay up-to-date with what is happening in my studio. Copyright © 2019 · JUDITH GLEASON GLOVER · WEBSITE DESIGN BY HOLLY KNOTT LLC.